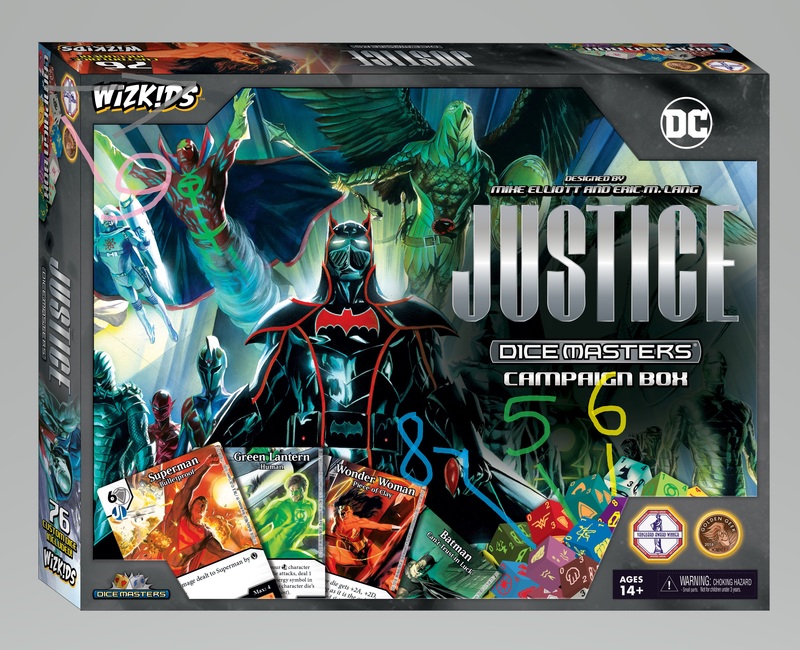 With Worlds now behind us, we have gotten some really cool spoilers for the upcoming Justice Campaign Box and its two team packs, Mystics and Doom Patrol. As many of you, I enjoy these absolutely awesome-looking cards. This article isn’t about the meta value of these cards though; it’s about some little, and sometimes huge, pieces of information that are hidden just below the surface. After recently assessing things completely wrong as to the extent of what this set will include, I looked into things deeper and discovered some interesting info. Before I begin, I would like to give a shout-out to two sources I will rely on throughout this article. The first is DMArmada. He recently made a fantastic video outlining all of the known (and a couple of new) spoilers from the Justice Campaign Box and related team packs. You can check out his video here. The second is the Dice Coalition. They’ve been providing a steady stream of information about this set from Worlds, and they’re one of my go-to sources of information on Dice Masters. You can check them out at dicecoalition.com for tons of awesome Dice Masters content (including their awesome team builder, which we regularly use in our articles). With that said, let’s look at what we have, shall we? First, let’s talk about the Justice Campaign Box. If you look at the back of the Campaign Box, it states that it includes “63 Character Cards”. Furthermore, looking at Wonder Woman: Piece of Clay”, she is numbered as “61 of 73” per the top right of the card. I thus assumed that we would have 21 characters, with 3 cards each. This assumption was wrong. I do not know how many characters we will have, but it will be more than 21 (min: 21 with 1 non-basic action), and we will not have 3 versions of each character. Here is the first thing that should jump out at you: If Metallo is 31, and Parasite is 32, this means that 31 is Metallo’s last card. If there were 3 versions of each character, his last card should be 30 or 33, or some other multiplier of 3. Either way, it doesn’t work. By my count, that’s 21 characters, to which we must add the unknown non-basic action. Now, if you go back to my incomplete checklist from earlier, the gaps between the cards become very telling. Between 6 (Batman) and 12 (Brainiac), somehow we have both Bizarro and Black Manta (taking up only 5 cards from 7 to 11), and Clayface is at 14, making it likely that one or two of Bizarro, Black Manta and Brainiac would only have 2 cards. Lex Luthor (26) and Metallo (31, which must be his last card due to Parasite) are also puzzling; Martian Manhunter’s sandwiched between these two, meaning that either he or Metallo has 2 cards for sure. Superman (44), The Flash (48) and The Joker (51) also raise questions: The Atom is in there somewhere. Unless his cards are so small that they don’t have a number, he goes between Superman and The Flash. However, The Joker has to contend with The Riddler (53), meaning he’d be, at best, 52-51-50 if he has 3 versions. This would make The Flash 49-48-47, and The Atom 46-45…Oh, Superman’s 44. So again, one or more of these three must only have 2 cards. And finally, and most mysteriously, there’s the gap between The Riddler (53) and Wonder Woman (61). We know Toyman is in there, as discussed previously. However, there’s space in there for at least one more character or non-basic action. Could this be where our mystery non-basic action fits? What locales could fit alphabetically between The Riddler and Wonder Woman? Let the speculation begin. One final point I wish to discuss on the Campaign Box is the number of dice we’re getting. Per the back of the box, we get 48 character dice altogether. With at least 22 characters/non-basic actions, it’s more than likely that we’ll get less than 3 dice per character. Furthermore, outside of Brainiac (max 2), all of the cards shown so far are max 4 (or max 5 in the case of Wonder Woman). 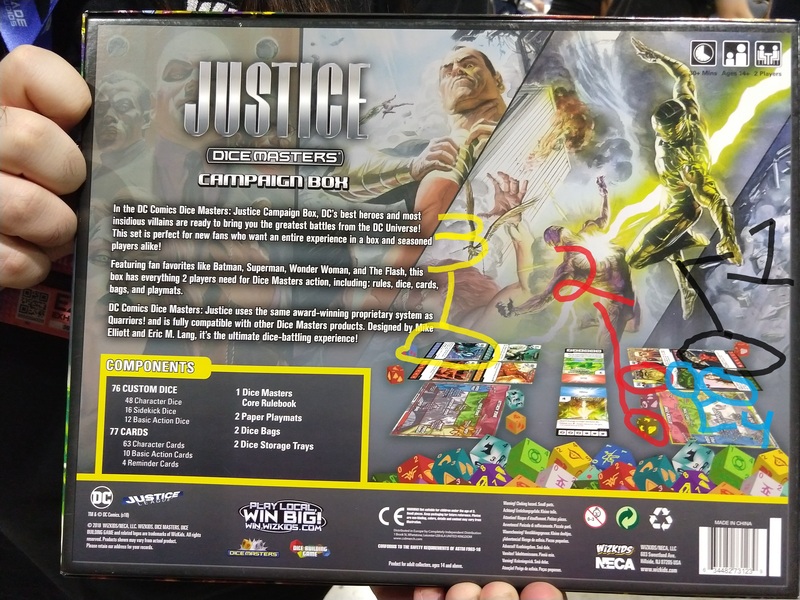 Be prepared for the fact that we will likely not get max dice here, and that buying two boxes of Justice may be far more necessary than with previous campaign boxes. I don’t like being the bearer of bad news, but we should be prepared for this possibility. And that’s what I can tell from the Justice Campaign Box. There isn’t quite as much information about the team packs, but we can still see some interesting tidbits. 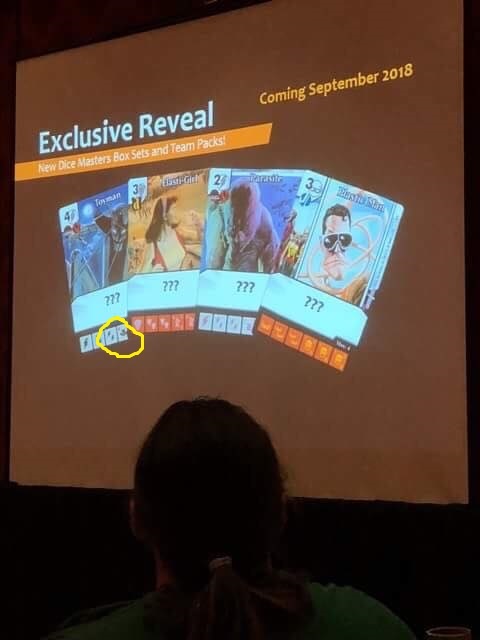 Cards from this team pack are identified as being “of 24”, with a hat (matching the logo on Zatanna’s die) shown at the top right of each card. 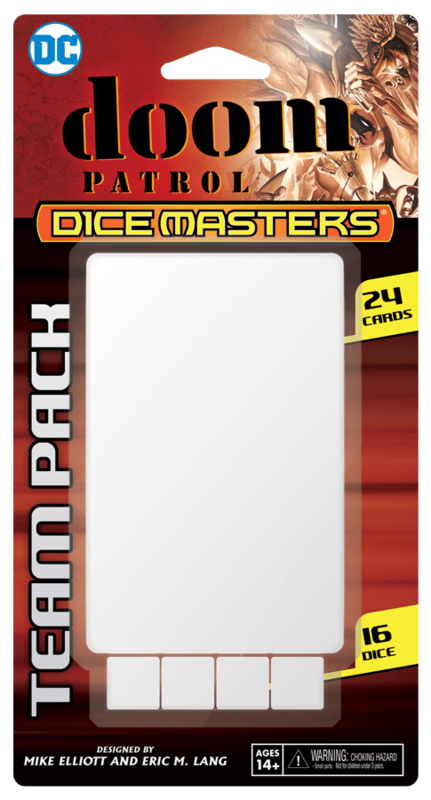 This leaves room (assuming the typical distribution of 3 cards per character and 2 dice per character) for 2 more characters. If you’ve read Justice, you should know that the Phantom Stranger plays an important role in this book; he would be a logical fit in Mystics. I am mystified (hah! ), however, as to the last character to include here. All we know is that the last character has a name that would start between Black Adam and Zatanna (yeah, not the best hint). I’m willing to listen to all possibilities. There is another character we may see. If you look at the original picture revealing this team pack, at the top right, this is a picture of Hawkman (taken straight from Justice). It makes it pretty much certain that he is featured in this team pack somewhere. Based on card numbering, we know that Elasti-Girl would be the third of 8 characters in the pack, with Plastic Man being the seventh. Robotman would thus appear to be the eigth. This leaves three unrevealed characters. One would have to be before Elasti-Girl, and the other two would be between Elasti-Girl and Plastic Man. There are a lot of potential characters to include here, and listing them would take a while. Suffice to say, I’m looking forward to seeing the characters we’re missing here. And there you have it. 🙂 Thanks for joining me into this deep dive into existing spoilers. Lots of interesting info in there for sure, and I’m looking forward to discovering more about this awesome new set. There’s lots of time between now and February, so I’m sure we’ll get a lot more information before this set releases. Feel free to discuss anything I might have missed in the comments down below or over on Facebook. Keep on rolling! EDIT: Fixed a mistake where I listed Green Lantern twice in my list of characters. It’s not 22 confirmed characters; it’s 21 + 1 non-basic action. Sorry about that! EDIT: Fixed a couple of minor mistakes resulting from my previous edit. This is some great detective work! I am going to take a wild guess that the mystery non-basic action is “Hall of Doom,” possibly with card numbers 22-24. The symbol on that die matches the symbol on the Hall of Doom podium in the Justice series EXACTLY. That’s a very interesting guess, and I agree that it’s an option. However, if that’s the case, there’s another character missing between The Riddler and Wonder Woman. Any thoughts on who this might be? * Male characters cannot block this turn unless opponent pays (1) per blocking character die. * Female character cards become unblockable until end of turn unless opponent pays (1) per blocking character die. Themyscira was one I was looking at too, and I agree; that’s a definite possibility. I think the Watchtower (the Justice League’s satellite) would probably make a lot of sense too. As a stretch, they could also have put Wayne Enterprises in. However, Themyscira or Watchtower are far more likely than Wayne Enterprises. I don’t think they’d put Wonder Woman’s armor or her lasso in that slot though. The lasso would make the most sense (again, for story reasons), but it would likely be referred to as the “Lasso of Truth”, meaning it would not fit alphabetically. In addition, anything named “Wonder Woman’s…” would have to go after Wonder Woman (for an example of this, see GATF, which has “Captain Cold” and “Captain Cold’s Cold Gun” one after the other). The Watchtower could be a lot of fun! What a great guess for a possibility! Wouldn’t it be cool if Mera were included in the Mystics team pack? She would be an interesting addition indeed. Mera would certainly be a cool option, and she does show up in the book. For what it’s worth, she’d fit into the information we currently have. We’ll see! The Cheetah would fit into the Mystics team pack nicely too. It would probably upset some people (who’d prefer new characters), but Cheetah’s use of Magic was a pretty important facet of the story in Justice, so I could see that. Bizarro getting one dice is disappointing. I always love a Bizarro in my villain team, but I’m not a fan of having to buy two sets to just get two of him. I’m hoping that the dice are all repeats of the earlier ones [judging by what I can see, at least the use of repeated symbols, it does seem likely] so I can replace Bizarro and Brainiac’s one measly die in this set with the dozen or so I have accumulated over the previous sets. That doesn’t help with the new cards, like Hall of Doom, with their one die though. Do you have additional information that we do not? So far, I have seen no information suggesting only one die per character. All that I know is that we are unlikely to get 3 per character based on the information available. If you have any additional confirmed information, however, do please share it, as it would be quite helpful. Thanks! EDIT: Nevermind, just saw the Wizkids page update. Wow, massive info dump there! Really disappointed to see a space in the Doom Patrol set wasted with another Black Canary, when she could have very easily gone in the Justice box. I know these sets are ridiculously tediously linked to the names used, but come on now. As with my other reply, quick question: do you have any official source confirming this? I haven’t seen any Black Canary cards anywhere in the spoilers that are available. If you could share the source, would be appreciated. Thanks!